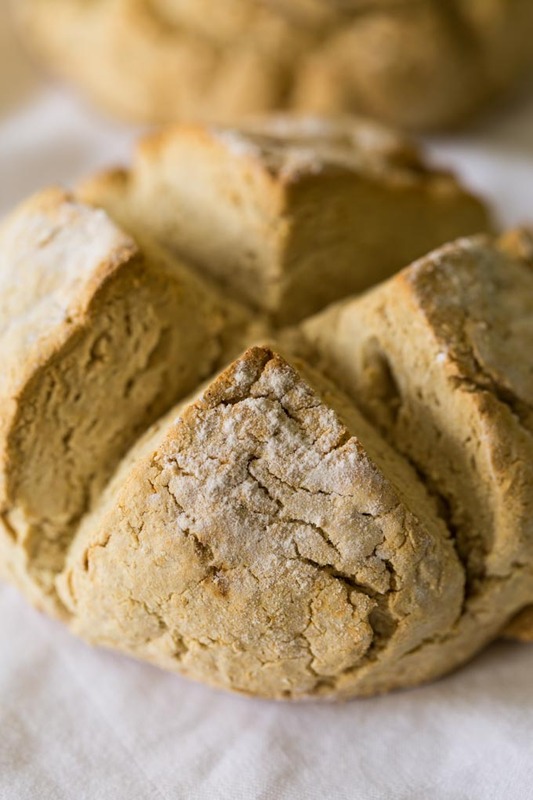 This gluten free Irish soda bread recipe was sponsored by Cooking with 7 Kids. All thoughts and opinions are my own. Simple gluten free Irish soda bread containing just flour, salt, sugar, baking soda, and buttermilk. Inspired by traditional soda bread recipes. When it comes to Irish soda bread, I’m a bit of a purist. No currants allowed! The time-tested combination of flour, salt, sugar, baking soda, and buttermilk is good enough for me. 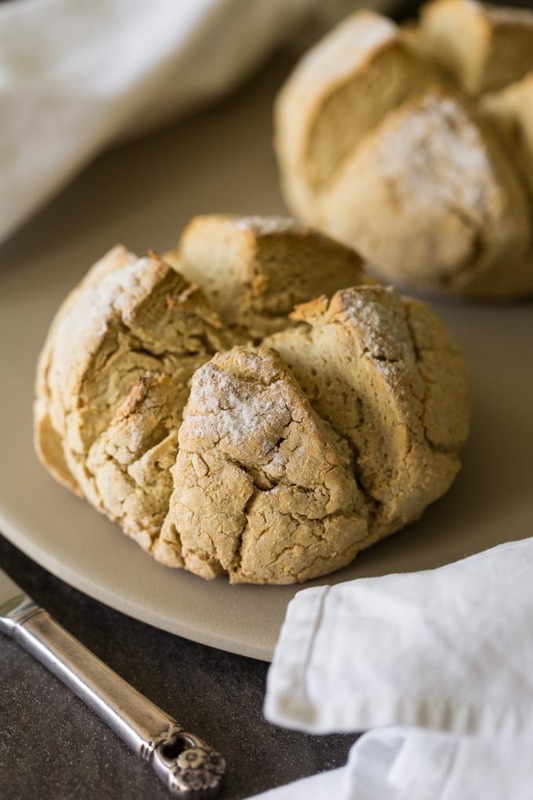 The traditional soda bread recipe uses all purpose flour (soft wheat) as opposed to bread flour (hard wheat), because all purpose flour has less gluten. That means that since gluten isn’t as essential for this type of bread, it’s much easier to make it using gluten free flour. 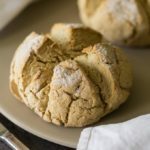 It’s a very easy gluten free Irish soda bread recipe, and there are a few secrets to making it come out perfect. First, there’s the importance of a hot oven. Preheating the oven is crucial. I like to bring the oven up to temperature first, before I start making the dough. This allows the oven to get really evenly heated. Second, there’s the baking stone. You can make gluten free Irish soda bread without a baking stone, but truly, it’s a secret weapon. When you preheat the stone inside the oven (while the oven is preheating), you create a perfect surface for baking. As soon as your dough hits the hot stone, bam! It starts springing upward and cooking at the proper speed. 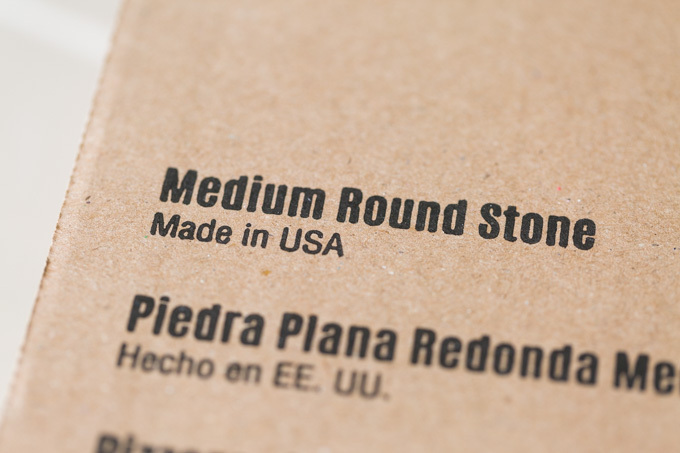 My baking stone is a medium round pizza stone from Pampered Chef. When I shop Pampered Chef, I always choose Cooking with 7 Kids as my consultant. 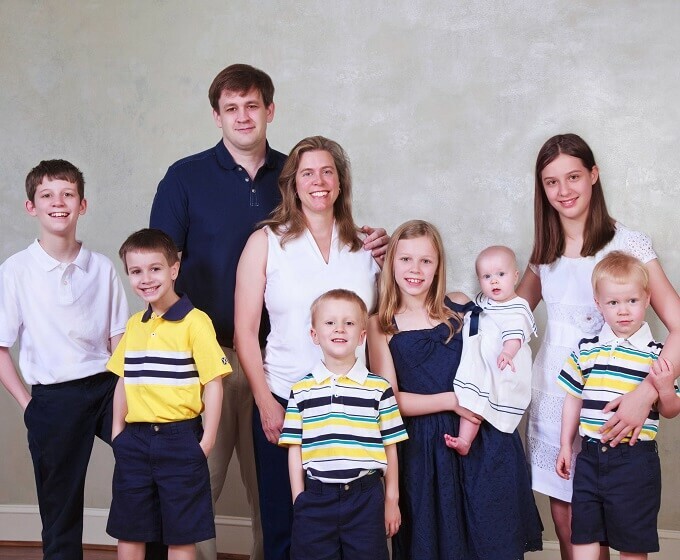 Cooking with 7 Kids was created by Gregory and Kimberly Cook, whose seven children help out in the family business and in the kitchen. As a family, they cook a lot—out of necessity! In addition to following their cooking adventures on their blog, you can find them cooking up a storm on Facebook, Twitter, Pinterest, and Instagram. One of the reasons that I chose Cooking with 7 Kids as my Pampered Chef consultant is that for every sale they make through Pampered Chef, they make a 10% donation to World Vision. This donation goes specifically to World Vision’s fund for Hurricane Maria relief in Puerto Rico and the Dominican Republic. If you’d like to make your purchase count, you can shop directly right here, or you can host a virtual party right here. After your purchase or party, Cooking with 7 Kids will make the donation to the World Vision Hurricane Maria fund and email the donation receipt to you within 2 business days. 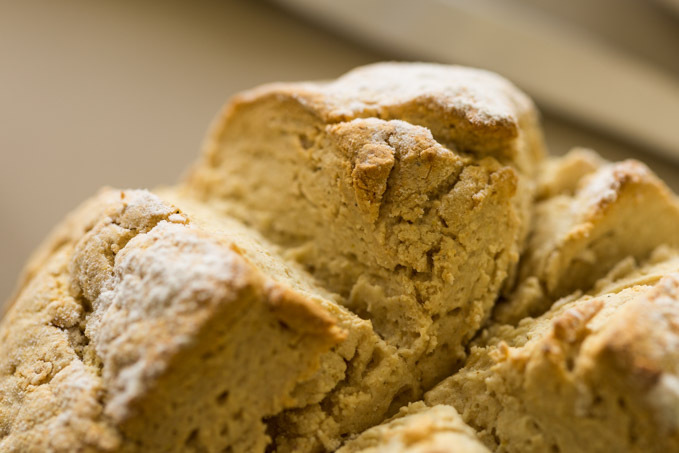 Now that you’re ready to be fully kitted out with all the best kitchen gear, let’s go over a couple of final details about making gluten free Irish soda bread. To keep the bread from becoming too stick or gummy on the inside, you must treat it delicately while it is dough. Don’t over-mix! Mix it until it just comes together, and knead it for a few seconds just enough to make it into a loaf. Then, when you bake it, err on the side of overbaking. Underbaking = not enough moisture evaporated = gumminess. Got it? Good. P.S. You can add currants if you really want to. And while you’re here, check out my gluten free shortbread cookies recipe, or visit my other blog for an Irish Potato Candy recipe! If you have a baking stone, place it in the oven on the middle rack. Preheat the oven to 400 F.
Combine the flour, salt, sugar, and baking soda in a large mixing bowl. Whisk until thoroughly combined. Make a well in the center of the dry ingredients. Pour in the buttermilk, then mix lightly with a fork until the dough comes together. It will be a little powdery, but if it doesn't stick together, drizzle 1 more tablespoon of buttermilk at a time over the dough until it comes together while mixing. Behavior of the dough will vary depending on what type of flour you're using. Tip the dough onto a lightly floured surface. Knead gently for 20 seconds. Form the dough into one even ball, then use a very sharp chef's knife to cut into 2 equal halves. Gently shape each piece into a round ball and flatten slightly. Each loaf should be evenly round with a domed top. Use your knife to slash a cross into the top of each loaf. Sprinkle a bit of flour over the top of each loaf for a decorative touch. Place the loaves on a piece of parchment on a baking sheet, or place them on your preheated baking stone (parchment optional). Bake for about 45 minutes, or until the tops of the loaves are golden brown. Let cool slightly before serving. 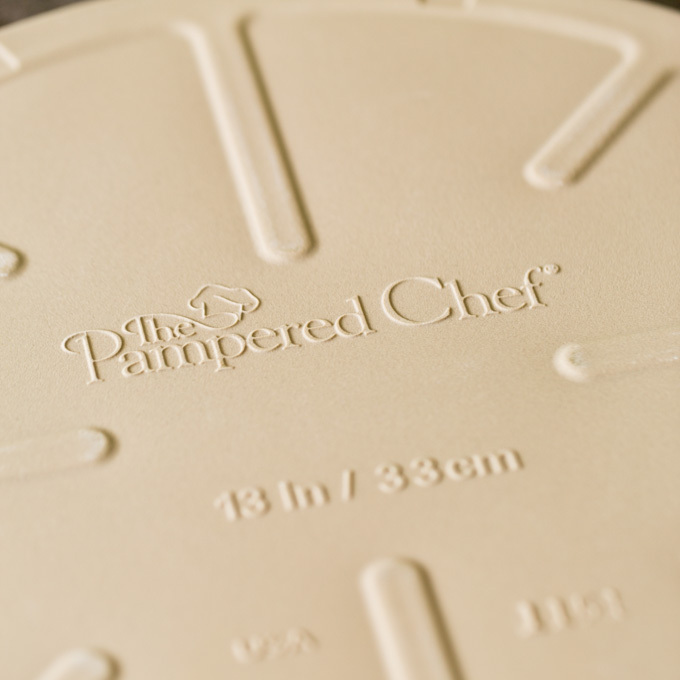 Check out the Cooking with 7 Kids blog and shop their Pampered Chef page! Have you tried using any other gluten free flours to make this? Not yet, but I’m planning on trying it with Bob’s Red Mill All Purpose Gluten Free, which has a different composition than the 1-to-1. I’ll update the post when I do.